PROPHET Emmanuel Makandiwa allegedly foretold the long running cash shortages and the introduction of bond notes meant to improve liquidity in the economy, according to a video recording which has gone viral. The United Family International Church (UFIC) leader gave the prophecy during a church service on January 1, 2011 – four years before the cash shortages started biting in 2015. 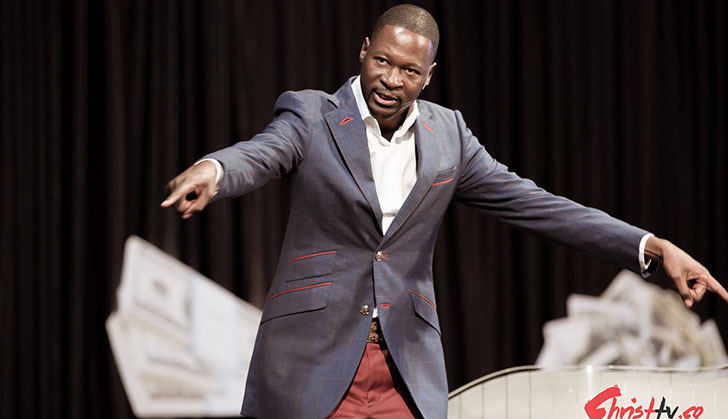 Prophet Makandiwa, who recently torched a storm over a video in which he said he had done everything to qualify for Heaven, told the congregates in 2011, that he saw in a vision that the United States allowed Zimbabwe to use its currency but the western nation would soon withhold its dollars and cause cash shortages. He stated that South Africa would offer help Zimbabwe but would not succeed due to a number of prohibiting factors. The UFIC founder and leader added that God even revealed to him that Zimbabwe would introduce home grown measures, in this case the bond notes, to contain the cash challenges. Prophet Makandiwa gave the prophecy two years after the country had adopted the multi-currency system in 2009. From 2009 to 2015, the banking public could access its cash without but problems started around 2015, resulting in the introduction of bond notes in 2016. Economists have given varied reasons behind the cash shortages including low manufacturing to generate export earnings, externalisation and lack of confidence in the banking system. But the new dispensation under President Emmerson Mnangagwa is working tirelessly to turnaround the economy and solve the cash problems. Prophet Makandiwa added that the US involvement in the cash shortages could be a plan to disturb the economy and influence how the 2018 elections will be held. In the video recording broadcast on UFIC's Christ TV, Prophet Makandiwa said; "As I was praying; I was moved to a certain place. I saw three birds, the first one feeds on fish – it's the fish eagle, the second one was an eagle which was carrying the stars of heaven and I tried to count the stars. "The last bird was carrying the sun; the funny thing about it, is that it had the ability to write some notes and minutes. The Lord showed me the place where the fish eagle, which was the main actor in this scenario, was staying. Its nets was made up of its feathers…ranga rakagadzira dendere nemunhenga waro. "There was a problem with the nest; the feathers were not enough to cover the family. The feathers were not enough to cover the fish eagle's children. "Then I saw that eagle with the stars of Heaven and it was flying coming from the West. When it observed what was happening, it dropped its feathers to help the fish eagle. The fish eagle was comfortable but as it was sleeping, that flying eagle returned without notice and forcefully took back its feathers as if the fish eagle had no right to use the borrowed feathers. "The fish eagle's feathers and its children were exposed for a season. Remember, the eagle with stars from Heaven just returned forcefully without notice and it was very aggressive and it affected the order of the eagle fish as it tried to cover itself with its own feathers. "The other bird had the ability even to carry the sun and could write. It visited the same place and looked at the situation. It wanted to help the fish eagle but the family of the bird which was carrying the sun could not allow their mother to help the fish eagle to the extent that they tried to kill the mother just to stop the relationship." He explains that the one which could take notes represents South Africa because the secretary bird is found on that country's court of arms and the sun is placed on top of the bird.